Well, we’re not in Honolulu anymore, but it was a snappier title! Today (Saturday) we arrived on Kauai but there’s lots to tell about our couple of days in Honolulu. Long travel – 5 hours from Toronto to Vancouver (which was delayed), the longest airport transfer ever between the domestic and international terminals, and then the 6 hour flight from Vancouver to Honolulu. No free movies or tv on that flight, either, which kinda sucked – but since we arrived in Hawaii at about 5am Toronto time, I was sleeping anyway! This one was the view from my parents’ room! There was a huge pool, although it got pretty darn crowded in the morning. Across the way right at the base of the hotel was the Royal Hawaiian plaza, filled with fancy shops and a pretty interesting food court. Coach, Ferrari (not the cars, but the apparel), Louis Vuitton, Tiffany…everything was there. I really liked how pretty much everything could be had in walking distance from the hotel! I know it’s pretty much a huge tourist trap, but sometimes that can be fun. We had a fancy dinner at the “Top of Waikiki” restaurant which is a revolving dining room. 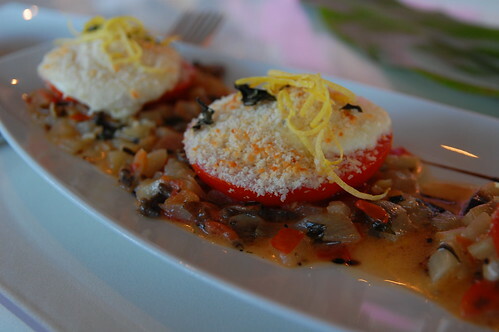 They did have a vegetarian entree, a tomato gratin with fresh mozzarella and mushroom ragout. 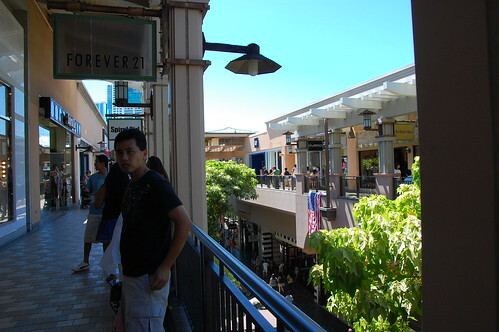 The next day my youngest sister and I took a city bus to the Ala Moana Center, a huge open-air mall – the biggest in the world if the map is to be believed! It really was huge, but we didn’t do the whole thing since it was pretty much the usual stores. I did manage to zero in (by sheer luck) on a Hawaiian chain store with super cute clothes, Cinnamon Girl. And that was pretty much it for our two days in Waikiki! 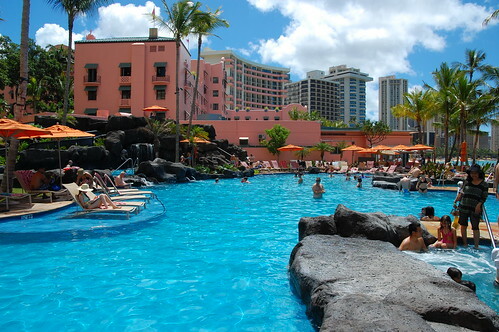 Good things about the Sheraton: excellent location, nice bed, nice lanai (balcony), nice pool, really good shower, excellent air conditioning, free wifi in the lobby. Not as good things: super overpriced food even in the casual cafe (but there was lots else to be had close by in the other mall), no free internet in the room, and since it’s a huge hotel, there’s just so many people! I did really like it though, and I would’ve liked to stay another day or two in Honolulu, at least to visit some other parts of the city. Now we’re on Kaua’i, everything must be driven to, and it’s much quieter. No air conditioning, but a kitchen. Everything’s a trade off! I think it’ll be pretty quiet here. 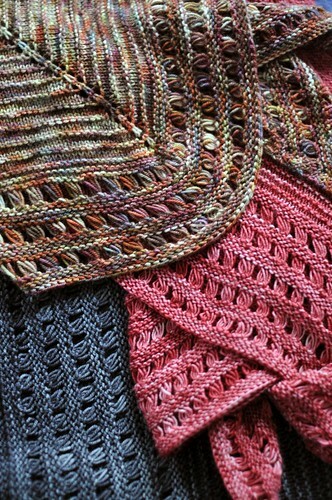 I’m hoping to get some knitting done! Great pictures! I’ve read about Honolulu but never been there. Clearly, quite an experience. We honeymooned on Kauai and it was definitely most gorgeous place I’ve ever been and we can’t wait to go back! It was so peaceful, green and beautiful – and the people were amazingly nice! We stayed on the north side of the island away from even the small touristy area and it was almost like we were locals ourselves! Glad to hear you are having so much fun! Very pretty; isn’t it amazing how different light and sky can be in different places? I think you are going to find Kauai absolutely delightful. Take a catamaran tour of the Na Pali coastline. What a lucky girl to be in Hawaii! Looks like an amazing trip so far and enjoy the rest of the trip! The Keyboard Biologist is in the same place – maybe you’ll run into each other! I had to laugh at this, because I just did it a couple of weeks ago and ZOMG I thought it would never end. :D Enjoy Hawaii! Simply beautiful. I went to the islands about a dozen times in the 60’s and 70’s and now haven’t been back since 1976. Wow your pictures make me want to go back pronto! if you need hiking go to waimea canyon! and don’t forgot your camera! There is a nice little yarn shop out in Hanalei. Don’t miss the Shrimp Tacos at the Shrimp station. Still on Kauai and loving it! It sounds heavenly. Between you and Theresa, I am going to get my tropical getaway without leaving Boston! Love the photos and I’m really happy you’re having such a good time! If you make it to the town of Waimea, be sure to stop by JoJo’s… it truly is the BEST shave ice on the island! The hubby and I took our first (hopefully not the last) trip for our 10th three years ago. 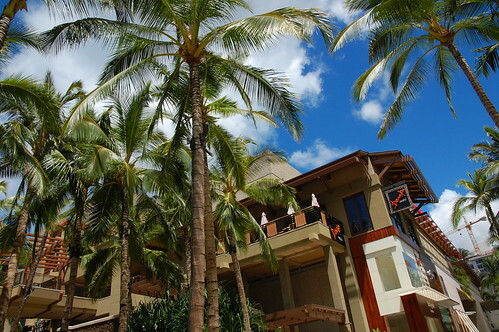 We were gone 11 days – half on Oahu (Looooooved!!) and the other half Maui (not so much). 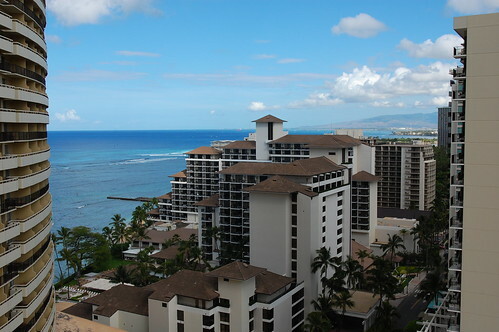 The hotel we stayed in on Oahu – Outrigger Waikiki – is just on the other side of the Royal Hawaiian from where you were. 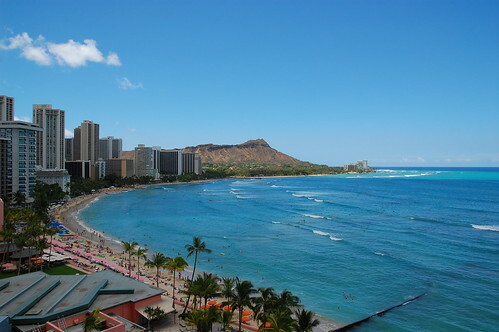 We had a fabulous view of Diamond Head from both of our lanais. We lucked out and got bumped up to a suite because they over-booked. We also went to dinner at Top of Waikiki (the restaurant rotates and on Friday nights you can see the fireworks from there). I absolutely loved all the touristy stuff we did and can’t wait to go back and just hang out.